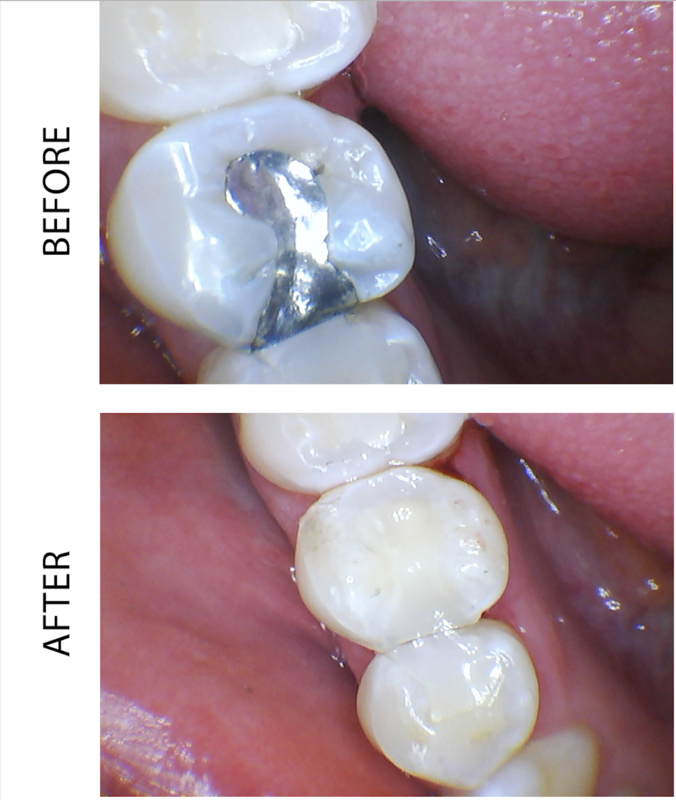 Our office places both amalgam (silver) and composite (white) fillings. Our placement of which material depends on which material your insurance covers. Many insurances cover amalgam fillings on back teeth, but composite fillings on front teeth, and ask the patient to pay an "upgrade" fee or co-pay if composite fillings are desired on back teeth. As with any treatment, we always let you know which material is covered. Both materials are extremely safe and have been tested time and time again by the American Dental Association and countless other associations throughout the world. Bonding is an obvious improvement over silver amalgam fillings. With the advancements in dental technology, bonding usually lasts for over 10 years. It is a safe, affordable, and attractive solution for many dental problems. Below is an example of a patient who opted to convert all of her amalgam fillings to composite ones. Though this is not always recommended (for example, if the existing amalgam filling is too large and removing it might cause further removal of good tooth structure), in the majority of cases it is safe and looks great!